Having registered six goals in Ole Gunnar Solskjaer’s first 10 matches in charge, nine of which have been wins, Marcus Rashford’s form has certainly been exceptional since the Norwegian took over the managerial reigns. After notching his 150th appearance for Manchester United vs. Brighton and Hove Albion recently, where he scored another pivotal goal, the youngster’s tally moved up to 41 goals in that sequence. Not bad at all considering Cristiano Ronaldo and Wayne Rooney reached 25 and 45 in the same time frame respectively. 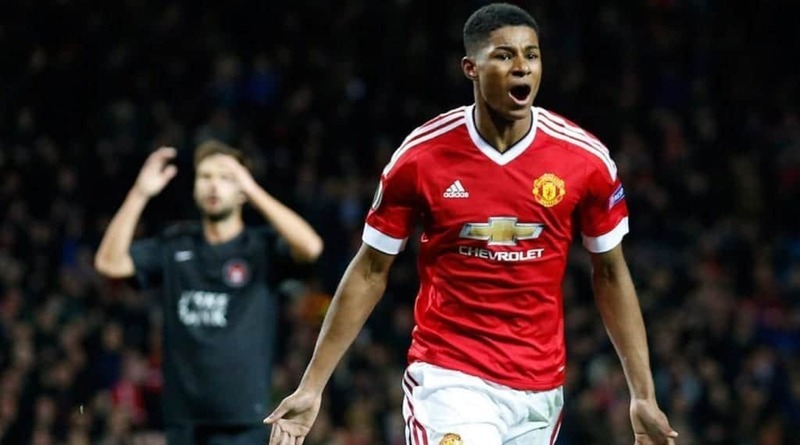 Upon being quizzed on whether Rashford could one day reach this level Solskjaer wholeheartedly backed the 21-year-old, saying: “Yes. Definitely he can be absolutely top-class. He is only 21 but the maturity he is showing at times is more than 21 and his work rate. Then, to mark his 100th Premier League appearance, Rashford duly bagged the winner against Leicester City at the weekend, taking his tally to 26 in that stretch. With the Red Devils rejuvenated, happy and playing some exciting football under Solskjaer’s guidance, Rashford’s been an integral component towards their amazing form. Handed a start in eight of 10 games under the new boss, he’s clearly relishing playing consistently and being trusted completely. One of the key cornerstones behind his success has been his proficient movement, which in combination with his spatial awareness, understanding with his teammates and searing pace, has seen him pose a massive threat to his adversaries. 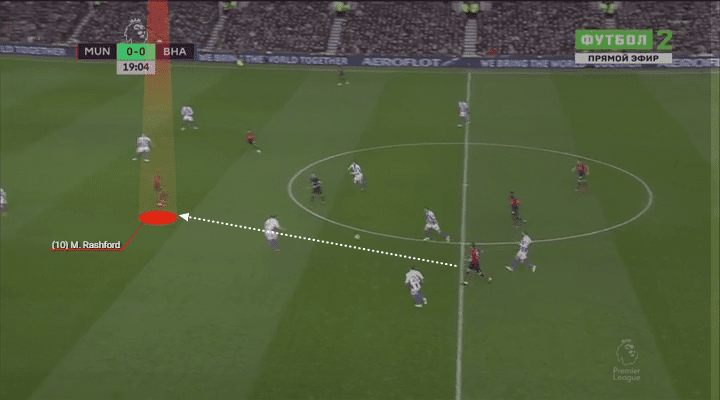 To start with his runs in behind, and the Englishman is always scanning his surroundings to refresh his imagery of where the available spaces are in relation to his teammates, defenders and the ball. Arming himself with this information ensures he chooses the right moments to embark on his depth runs so he can gain separation from his markers to surge ahead unimpeded. Adept at using the pockets in between defenders, using decoys and instigating his runs on the blindside of his opponent, he constantly gets the better of his tracker, who are regularly caught ball watching or occupied by another opponent. 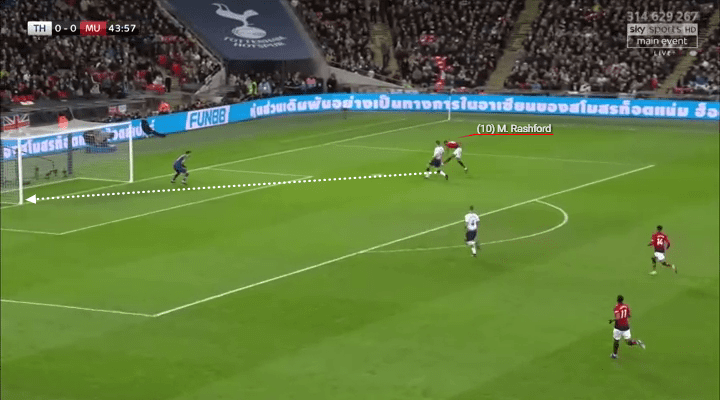 Rashford’s timing is usually on point too, for he’ll only get on his bike if his teammate has his head up and can use their preferred foot to tee him up, thus enhancing his chance of being pinpointed. 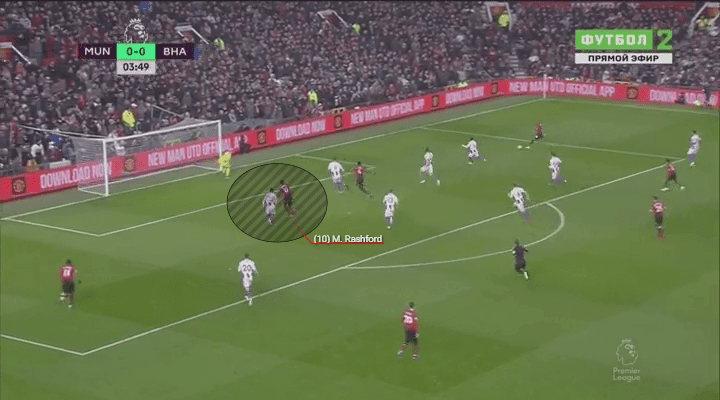 This aspect of his armoury also transfers over to his instinctive movement inside the box, as he’ll either check his run while the defence collapses back towards goal or use his acceleration to get goalside to optimise his chance of reaching deliveries. 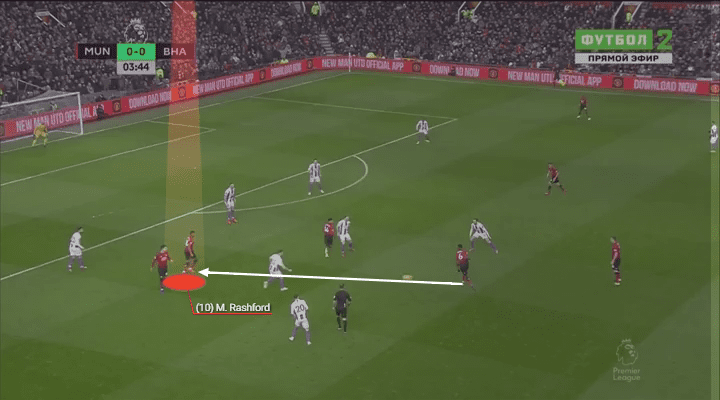 Rashford’s capacity to drop deep to hold the ball up is also a bonus, with this allowing him to connect midfield and attack and draw his man out of shape to create space for a teammate. 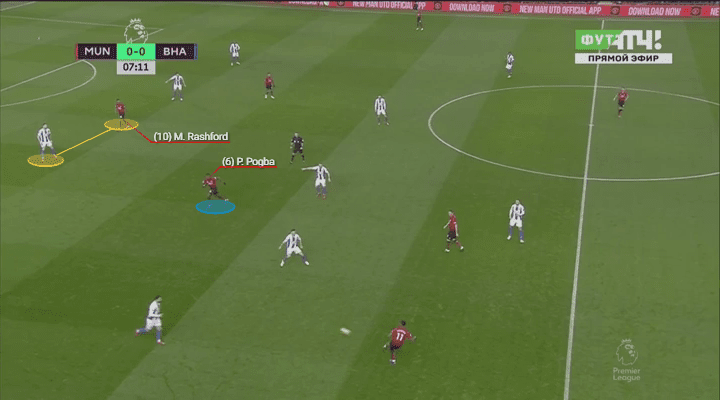 In addition, the way he pins and drags one or multiple markers away to generate openings for a teammate to use, rotates deftly with his fellow attackers and exploits the channels in behind the fullbacks (especially in transition), has only amplified his menace. Upon getting the ball at his feet, the explosive forward contributes admirably, giving his team an added layer of offensive impetus. 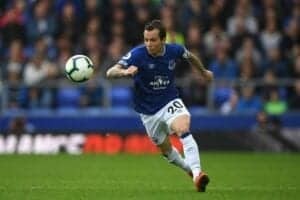 Although he loses the ball at times, which is to be expected giving the close attention he typically receives in his advanced position, he’s neat and tidy with his first touch, ball control and one and two touch passing. Indeed, this enables him to link play cleanly and help unlock defenses. Particularly eye-catching is his crafty array of flicks and back heels that persistently unsettle backlines and find a teammate in an advantageous forward facing body shape. A terrific ball striker, the 21-year-old’s set piece taking and finishing have set him apart too. Starting with the former, the way he imparts great dip and swerve, while still being accurate and powerful, his deliveries have been of a high standard. Whether hitting free kicks or in other dead ball scenarios, there’s been a lot to like about his efforts here. Then, when it comes to his finishing, he’s been outstanding of late, as he’s playing with swagger and confidence. 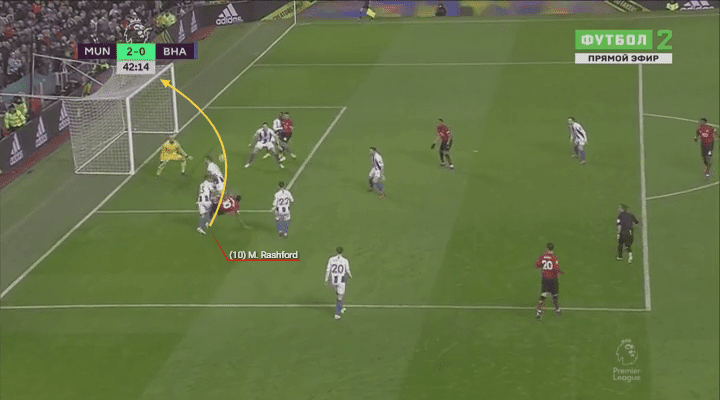 Parlaying power, finesse and placement, there’s no doubt working with Solskjaer, who was an absolute master at the art of finishing, and being trusted upfront, is doing wonders for him. Wreaking havoc on the dribble to boot, where his nice repertoire of skills and feints, plus wicked changes of pace and direction, has caused immense issues for his opposition. Direct, unpredictable and effectively provoking pressing actions, his ball carrying has been an undoubted highlight. By the numbers, his quality has been accordingly illustrated by his 2.66 shots per game, 3.54 successful dribbles pg, 1.27 shot assists pg, 3.48 touches in the box pg, 1.46 progressive runs pg and 1.2 key passes pg. 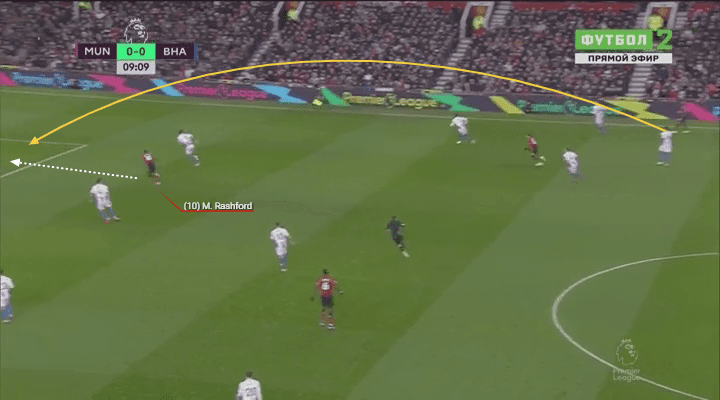 Full of athleticism, capable of hurting the opposition in a variety of different manners, coalescing wonderfully with his teammates and operating with the utmost conviction, Rashford’s remarkable forms is showing no signs of slowing down. All it took was for Solskjaer to be installed and return some positivity and excitement back into the players and their football. And Rashford’s certainly been a key beneficiary of Solskjaer’s stewardship.